I was walking down the sidewalk when I looked over and saw this great looking pair of eyes staring at me. I immediately told Terry’s mother that he had quite a pair of eyes. She shyly smiled and said that he already seemed to know how to use them to his full advantage. Terry and his mother were there to cheer his dad and uncle to the finish line. I asked his mother if she minded if I took a few shots of Terry. This is my favorite photograph of him. For some reason, I really like the way he was intently staring at something, but from my perspective, I did not know what it was. It seemed to give the photo a little added mystery. Camera settings: Nikon D3, Nikon 70-200mm f/2.8 at 200mm shot at ISO 800, f/5.6 and 1/90th of a second. Photoshop—used nik Color Efex Pro tonal contrast to his jacket. I love the blue in his eyes and the look on his face. The photo definitely makes you wonder what he was thinking or looking at when you pressed the shutter. There is good detail and color in the jacket and his hood. Nicely done exposure and skin tones in his face. I think it would be better without the blue colored distraction to his right. It doesn't add anything to the photo for me. The red area to his left is muted enough to not really be a problem, but would not hurt if it was gone too. Silly as it seems, I would crop in from his right to just where his coat intersects with his mom's sweatshirt and a tad from the top. I think it would add just a touch more impact. You always seem to be able to see these kids in the crowd and capture their emotion or facial expressions with ease. I guess that's the mark of a pro. Doug's right. The blue in the background is distracting as is the mother's sweet clothes but I would crop from the left to get rid of both the blue and the grey areas. Love the eyes and love the look. He is adorable. I do agree that the background is distracting. Would like to see you fix it. I think you are on to something here however the photo does not appear to have your normal refinements. Terry just does not seem to separate from his surroundings. I agree with everyone. The background needs work. 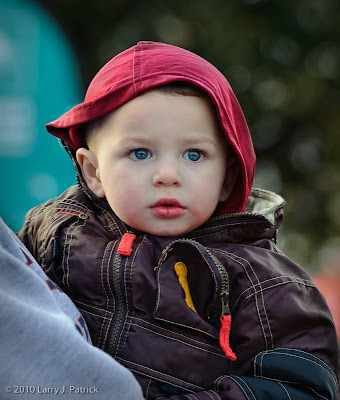 Would like to know how you start a conversation with a stranger and get her to agree to photographing her little boy? Like your blog however I wish you would spend more time talking about your thinking before you take a photograph. Is the background a problem? This is street photography. That means you photograph people where they are and without your direct intervention with them. I think we sometimes apply the same standards to all types of photographs. PS--Larry, I also do not think that the background does not do Terry any service. You can do better by him and his mother.